GPU stands for graphics processing unit. The term refers to a major component of high performance computers. A GPU's performance is much faster in many applications than the performance by a more standard central processing unit (CPU). A GPU is a programmable chip originally designed for use in virtual reality and gaming devices which rely intensively on graphic displays for their impact. They are often sold already installed in boards. GPUs process vectors of data efficiently making them useful in other applications, such as cryptocurrency mining. Their use has been supplanted in a number of applications, like bitcoin mining, by application-specific integrated circuits (ASICs), which are dedicated to solving a single problem. Ethereum's reliance on a memory-intensive protocol was thought to assure its resistance to ASIC-based mining but Bitmain, the largest producer of ASICs specifically for bitcoin mining, announced that it had designed miners suitable for mining ether. 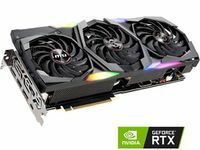 The prolonged downturn experienced by cryptocurrencies during 2018 threatened the profitability of two major GPU manufacturers, AMD and NVIDIA, which reported significant inventories of unsold chips. Despite the fall-off in demand from bitcoin mining, GPUs continued to be used extensively in Ether-mining equipment as well as in equipment for mining other so-called ASIC-resistant cryptocurrencies. In its Q I 2018 financial report NVIDIA revealed its chip sales for cryptocurrency mining applications for the first time, saying that its revenues reached $289 million for the quarter. The company also predicted a decline of two-thirds for the next quarter. ↑ Definition of: GPU. PCMag. ↑ How application-specific integrated circuits are powering the future of IT today?. CIO. ↑ Ethereum ASICs Are Here: What the New Miners Mean and What’s Next. Coindesk. ↑ A Brief History of GPU. Medium. ↑ AMD and Nvidia's crypto problems 'will persist longer than expected,' RBC says. Markets Insider. ↑ Nvidia Reveals Crypto Sales for First Time and Predicts Big Drop. Bloomberg.